Chad Lyman Niell graduated from A-State in 1991 with a bachelor in marketing. He and his wife Pam are founders and owners of Tiger Correctional Service located in Jonesboro. Tiger Correctional Service provides inmate food service, commissary and banking, along with accounting software and jail management software, to 200 federal, state and county correctional facilities throughout the country. 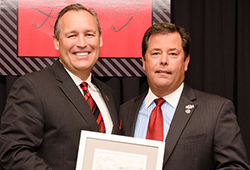 Chad and Pam are longtime supporters of A-State, and Chad has generously established an endowed scholarship to help students in the College of Business develop the skills to pursue the American dream, like he has.